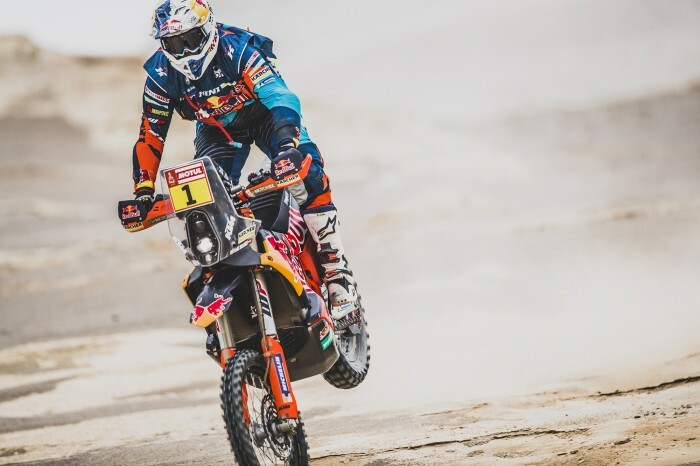 Reigning Dakar champion Matthias Walkner beat Pablo Quintanilla by just 45s to win stage eight in the desert and moved up to third in the overall standings. Walkner, like Red Bull KTM team-mate Sam Sunderland, had to contend with dust from cars in front and also fog that descended over the dunes but the Austrian was happy with his work. “I really tried to push all day long. Starting with the cars was not so bad this morning, a couple caught me on the fast pistes, but I passed them back again when we hit the dunes,” said Walkner. “I got to the refuelling and saw that Toby had made some time so I knew I had to really go for it in the sand. I had a couple of small crashes in the fesh-fesh, it was really foggy and a lot of the time you couldn’t really see too well ahead of you.